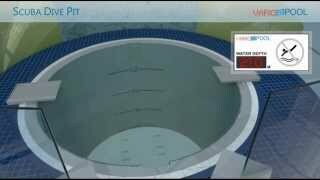 Diving pit for public pools with a movable floor by Variopool BV. We can install a movable floor in diving pits to help divers train in a safe and responsible manner, facilitating diving lessons. Variopool developed a round and floating and movable floor that can be lowered to a maximum depth of twenty metres. For budding divers, the floor can be installed at a depth of three meters and for more seasoned divers the pool can be configured at its maximum depth. A movable floor in the diving pit makes the swimming pool suitable not only for (scuba-)divers but also for other activities and other target groups who can use the movable floor diving pit. For example, it is possible to put the movable floor on a depth of around 40 centimers so kids can play in the round pool. Multi functional! For more information our requests please use our contactform.